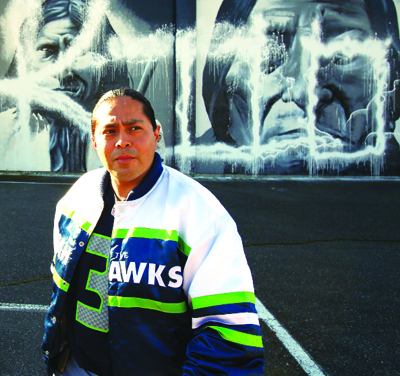 Andrew Morrison, San Carlos Apache and Haida, is a phenomenal painter and muralist who is proud to call Seattle his home, he is a great 12th Man Seahawks fan, and considers a blank wall his absolute greatest resource. Morrison’s PechaKucha presentation was on the past, present, and future of the great Indian Heritage High School murals he created of Chief Sealth, Chief Joseph, Geronimo, and Chief Sitting Bull. Morrison and many of his friends attended Indian Heritage High School (IHS) in Seattle. In 2001, after attending college, Morrison began volunteering in the art program and noticed there was a void within the school. “I saw there wasn’t a lot of artwork on the walls of the school. The walls were very blank and very dormant, without energy. 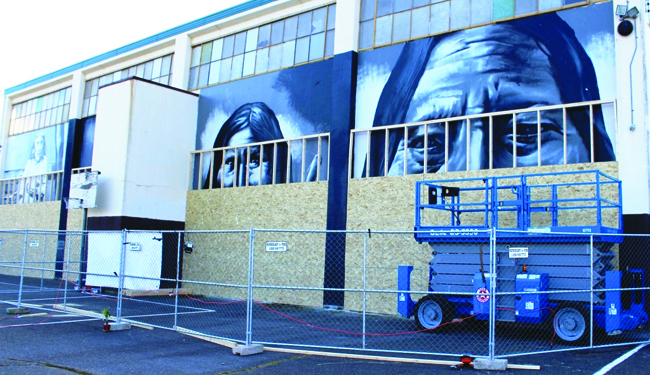 As a muralist, as a painter, I’m always striving for larger surfaces,” explained Morrison of his motivation to begin painting 25-foot by 100-foot large murals of Native American heroes. It was a twelve-year project to completely finish the four mammoth murals on IHS, beginning in 2001 and being completed in 2013. The massive portraits of Native American heroes was noticed by news outlets, tribal and non-tribal alike. The portraits are a source of pride for many Native people who don’t see their heroes recognized as they should be. Unfortunately, there were those who saw the massive portraits as an opportunity to vandalize another’s work to showcase their own ignorance, as the mantra goes, ‘haters gonna hate’. Over the weekend of February 24, 2015 a local graffiti crew desecrated the murals by splattering white latex paint all over them. Only days later a cleanup operation, led by Morrison, consisting of 30-35 volunteers worked tirelessly to remove the white spray-paint and restore the murals to their former glory. As if the vandals’ desecrations wasn’t enough, soon after restoring the murals Morrison learned there was a proposal in the Seattle School District to demolish Indian Heritage High School, along with his murals. 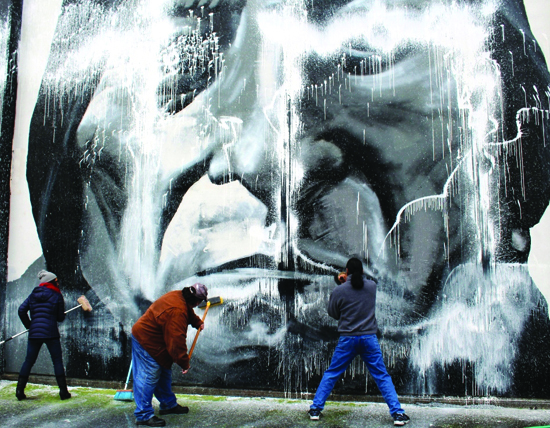 “I fought and advocated for a year straight, twelve months exactly, to preserve these murals. I felt these images of our Native American warrior chiefs were so sacred and so holy that to demolish them to the ground would be another form of desecration. That was a very tumultuous battle and fight, but I give the credit to the community and the people who believe in art and believe in our indigenous culture. Through the power of togetherness we were able to get the Seattle School District to vote to preserve these murals. Now, these murals are presented prepped and ready to go as they will be built into the new Wilson Pacific Schools to be opened next year. Bouncing back from financial and staffing controversies last year, the Santa Fe Indian Market this August is promising a newly contemporary flavor. 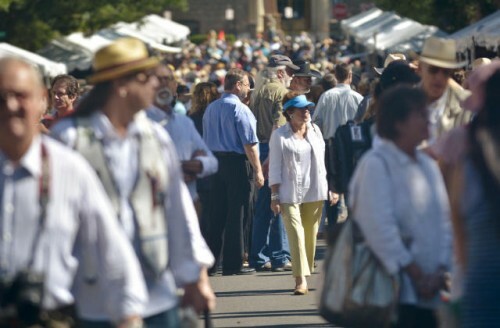 It’s not that the standards are changing substantially for the main market on the Plaza, although last year and this year some rules have been loosened to allow some non-traditional materials and techniques – variations that must be disclosed, said Dallin Maybee, chief operating officer for the Southwestern Association of American Indian Arts. “We want to protect the collectors, as well as the artists,” he said. More important, this year’s market will see a new expansion called Indian Market Edge, which will offer indoor spaces at the Santa Fe Community Convention Center to galleries and Native American artists who create contemporary fine art, he said. While some artists who produce works in a contemporary style have complained in the past that they didn’t feel there was a place for them within the traditional bounds of Indian Market, Maybee said he felt that he had seen many artists include innovative works in their booths. Adding this contemporary showcase, though, will shine a spotlight on modern works being produced by Native artists, he said. “The people I’ve approached about the concept are really excited,” Maybee said. “This will help us stay fresh. We have to change with the times or we lose aspects of our culture.” Contemporary art is an aspect of tribes’ cultural evolution, he noted, adding that he creates some contemporary works himself, as do many of his friends. “I’d like SWAIA to be known not just for traditional mediums,” he said. The idea is to offer 12-15 spaces to galleries that represent Native artists to show their works, while SWAIA will review applications from independent artists and choose about six to eight to showcase in its own space. He said the IAIA Museum of Contemporary Native Arts has expressed an interest in participating. Altogether, Maybee estimated that 30 to 40 artists will have their work in Indian Market Edge. Booth fees won’t be charged, but SWAIA will take a “small percentage” of any sales, Maybee said. 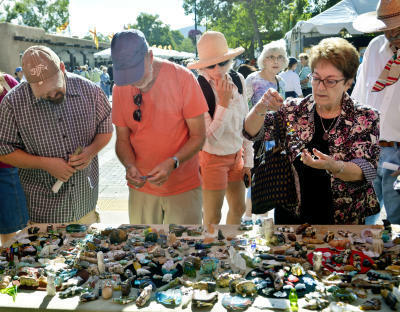 Some 900 artists take part in the outdoor Indian Market, slated for Aug. 22-23 on the Santa Fe Plaza. Those artists keep the proceeds of their sales, but pay a fee for their booths. SWAIA, the organization that makes Indian Market happen, went through some turmoil last year when former operating officer John Torres Nez left with two other staffers to form the Indigenous Fine Arts Market, which presented artists in the Railyard on some days overlapping Indian Market and promised a greater voice to artists in how the market was produced. According to its website, IFAM intends to present a market again this year Aug. 20-22. That split came about when SWAIA was experiencing financial troubles and reduced work hours of some of its staff. Maybee said this week that the organization no longer is experiencing financial woes. It paid off its loans after last year’s market and hasn’t taken out any new loans since, he said, partly due to the fact that last year’s gala auction raised a record amount of more than $400,000. The Festival of Trees was a program in which various businesses and artists decorated Christmas trees that were auctioned off as a fundraiser. Eventually, Maybee said, he would like to see Indian Market go from producing events to being a year-round presence – about 50 acres would be a good size for a site to establish a permanent presence with art on display and for sale, not unlike the Indian Pueblo Cultural Arts Center in Albuquerque, he said. That’s all still in the talking phase, though, and would require a considerable amount of fundraising, Maybee said, adding that a new development director should be coming on board in a month or so. Santa Fe would be the location for such a project, if it came to fruition, he said. The Native Cinema Showcase, starting earlier that week, along with the Classification X winners for submitted films. 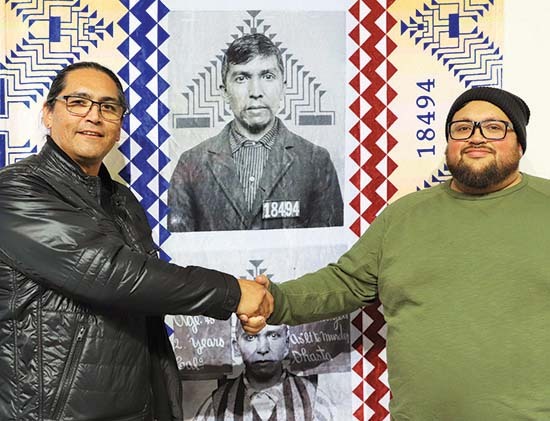 A Thursday-night private preview reception where donors and tribal leaders can mingle and view the Best of Show winners; jeweler Raymond Yazzie, whose family currently has a show at the National Museum of the American Indian in New York City, will conduct a book-signing. The Native American Rights Fund, a nonprofit law firm from Denver that defends Native sovereignty and other issues, will offer panel discussions exploring various Native issues in Cathedral Park on Saturday and Sunday. Fashion events to showcase both contemporary and traditional fashions produced by Native designers. An auction that will feature many artworks, including a four-place table setting that will be auctioned off en masse with everything from place mats to wineglasses produced by a bevy of Native artists. A farewell party, by ticket purchase, Sunday night at La Mesita Ranch past Pojoaque, organized in collaboration with Buffalo Thunder Resort and Casino, with music, food, wine, spirit tastings and more. Why Buy ‘Native Inspired’ Products When You Can Get the Real Thing? 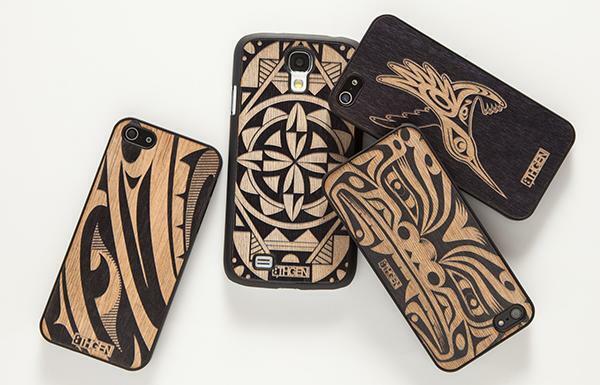 The ‘Inspired Natives’ collection includes these mobile phone cases designed by Louie Gong and Michelle Lowden. When a big apparel or furnishings manufacturer looks to Native culture for inspiration, the result is “Native-inspired” product that has better distribution than most actual Native designers can hope for. These designers can get the feeling they’re having their pockets picked by the big boys — and in extreme cases they undoubtedly are. Louie Gong, Nooksack, one of today’s most successful Native design entrepreneurs, has seen it happen enough in his field, and he’s decided to do something about it with a project called Inspired Natives, an initiative to promote Native artists. According to Gong’s website, the initiative’s goals include: build the business knowledge and capacity of popular Native-arts entrepreneurs so they can meet demand for their work worldwide; show companies how to create and sell products featuring Native art in a way that supports Native people; and raise awareness about the cultural and economic impact of cultural appropriation and misrepresentation. The first designer Gong has tapped for the project is Michelle Lowden, Acoma Pueblo. Lowden now has her own section at eighthgeneration.com, featuring pillows, a blanket, and a notebook with her “Transformation” design, and mobile phone cases with her “Rainstorm” design. The pillows and notebook designed by Michelle Lowden, Pueblo Acoma, are part of the Inspired Natives line of products. Gong encourages consumers to support artists who are inspired Natives, not Native-inspired artists; think before they buy a product featuring indigenous art; and use the hash tag #INSPIREDNATIVES. 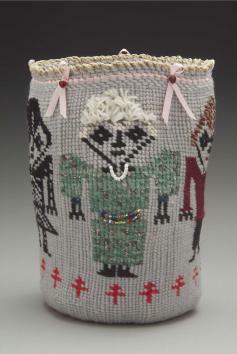 Breast Cancer Awareness Basket, by Pat Courtney Gold. Photo by Bill Bachhuber, Portland, OR. 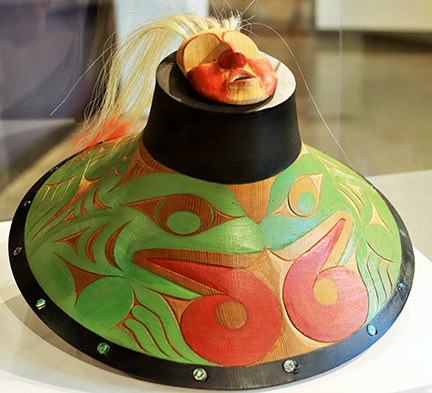 Join the Burke Museum for a celebration of Northwest Native art. 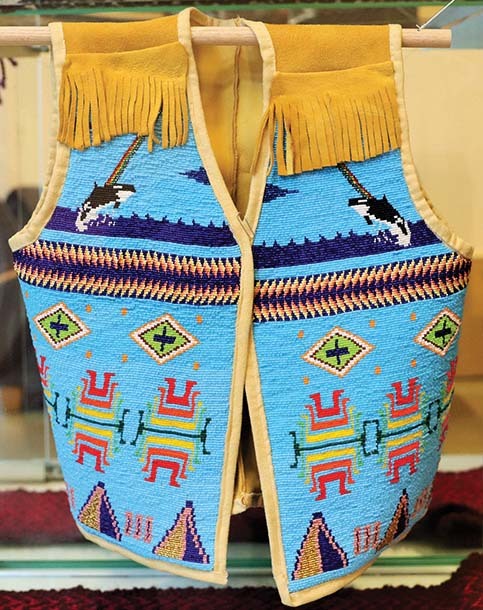 Watch demonstrations and examine the incredible artwork of local Native American artists, who are experts in mediums such as weaving, basketry, and beadwork. Take part in hands-on art activities for kids and adults. Also attend talks about supporting indigenous artists and various basket and weaving techniques of Northwest Native Peoples. Renowned NW weaver Pat Courtney Gold leads us through a richly illustrated introduction of the 12,000 year history of NW basket weavers, the materials and techniques they use, and the unique baskets that they create. 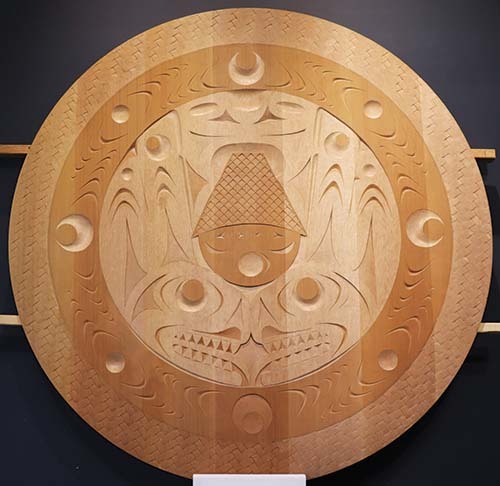 Anna Hoover’s Anchorage-based non-profit, First Light Alaska, has drawn inspiration from The Banff Centre, Longhouse at Evergreen State College, Kinggait Studios, Maori bi-annual Artist Gatherings, and many other programs. She will discuss how these programs and her own are adapting to the ever-changing needs of the thriving indigenous arts community. FREE to Burke members, children ages 4 and under, and UW staff/faculty/students with UW ID. *Group tours may not be scheduled on these days. Check out our special admission discounts and promotions! The NW Native Art Show is now accepting vendor applications from qualified artists through the end of February. 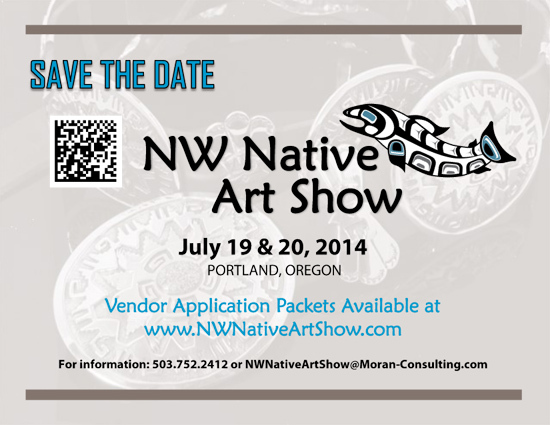 The NW Native Art Show will take place July 19th & 20th, 2014, in beautiful downtown Portland, Oregon, at Director Park. This event will feature top artists from the Northwest and beyond in addition to drum groups and traditional Native dancing. 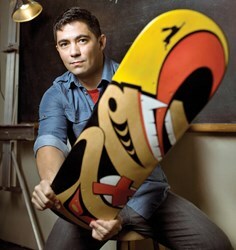 Applications can be downloaded at www.NWNativeArtShow.com and there is a $25 application fee. Applications will be reviewed and approved as they are received. Booth fees are $225 for single artists or collaborative artists and include 5’x10’ tented space, one table and two chairs. Artists are invited to enjoy an Artist Hospitality Tent as well as an Artist Reception on Friday night preceding the event. Artists are also invited to submit their work in a juried competition with cash prizes for Best in Show ($1,000) and Best in Category ($500). Categories to be judged are: Basketry, Jewelry, Wood Carving and Sculptures. All art must be the artist’s original work. The Northwest Native Art Show does not allow imported, manufactured or mass produced items. Artists must comply with current state, national and international laws and regulations with regard to the use of endangered species materials in their works. Use of such materials should be disclosed, in writing, to the consumer. Artists can learn more at www.NWativeArtShow.com, click on “Artists’ Corner.” Interested artists may also call 503.752.2412 or email NWNAtiveArtShow@Moran-Consulting.com. The NW Native Art Show is presented by Moran Consulting, a Native American-owned small business. A portion of the proceeds raised from the NW Native Art Show will benefit the National Indian Child Welfare Association (NICWA). Native Arts and Cultures Foundation (NACF) President and CEO T. Lulani Arquette is visibly moved as she describes how the audience responded to the innovative work of Christopher Kaui Morgan at the 2013 Council for Native Hawaiian Advancement Conference. “There was a palpable thrill in the room, a sense that we were witnessing something new and exciting. This is the kind of work we want to encourage,” she says. Not yet four years since it began funding, NACF has made significant investments to nurture native artistic expression, celebrate culture and engage communities. These investments help keep tradition alive — but also help indigenous artists push past old forms and break new ground. That clearly is what makes the work of NACF so significant. This isn’t just about feeding struggling artists. Underlying everything NACF does is the conviction that native artists and culture-bearers play a vital role in enlivening the community. Through its mission and its outreach, its grants and the platforms it provides for creative expression and collaboration, NACF attests to the importance of the artist as both voice and conscience, healing and keeping alive the hope of a better, more just world. NACF hopes that those who wish to put their wealth to work will see in the work of the Foundation the prospect of a return on investment that is more significant than what the market can offer. Founding NACF Board Member Elizabeth A. Woody (Navajo/Warm Springs/Wasco/Yakama) explains: “The act of giving was part of the ‘gifting economy’ of the Northwest where one’s wealth was measured by generosity, good work and a good heart.” That’s not unlike the spirit that moves those who engage in philanthropy. Thanks to that spirit of giving, donors across the country have allowed NACF to help 85 Native artists and organizations across 22 states. Awardees were part of over 300 events and activities, creating opportunities for 46,000 participants and taking the beauty and power of Native arts and cultures to nearly 850,000 people. Individual grants of up to $20,000 each help native artists continue to practice what has been handed down to them while also moving beyond to open up new ways of seeing the world. Time-honored ways of defining our shared humanity are preserved while new prisms are created through which to see and understand. Powerful voices are amplified in visual arts, music, dance, literature, film and traditional arts. People are not generally aware of the urgent need to map and secure ancestral arts and practices before they are lost forever. Nearly $380,000 has been given to grantees, some tied to universities, for this purpose. Apprenticeships, teaching, participation in youth programs and festivals also help ensure the transmittal of traditional skills to the next generation. This support seeds the ground for ongoing collaborations and exchanges, such as residencies, arts conferences and dialogue across native art disciplines. 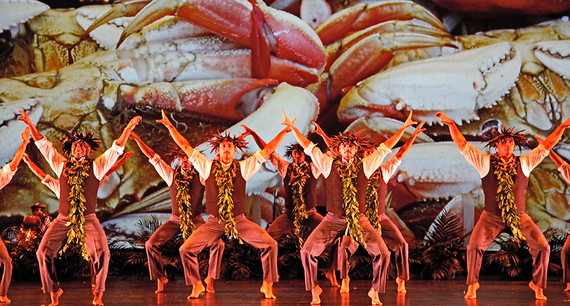 NACF creates partnerships between artists, tribal entities and nonprofit organizations. The spirit behind these partnerships is the recognition that the work of the artist is a lens through which to help the community understand and engage collaboratively in addressing issues vital to the well-being of the community. Proven leadership in offering broad-based arts services including arts grants, professional development for artists, and market opportunities for Native artists has led NACF to make an investment of nearly $300,000 in organizations positioned to help artists in these ways. In Hawai`i, the Pa`i Foundation received a NACF grant to support their work as part of a group dedicated to recovering the language, cultural traditions, healing practices, voyaging, and agricultural practices of the Native Hawaiians, now a minority in their ancestral land. Arquette is particularly proud to see artists in her native Hawai`i recognized, and is gearing up to announce new initiatives in 2014. “Our grants go towards helping artists address issues such as cultural equity, land and water rights, food sovereignty, and Native knowledge,” she said. NACF artists received a Bessie Award for Outstanding Dance Production, had an exhibit at the 18th Biennale of Sydney, Australia, and are taking their film to the national festival circuit and PBS. “This kind of recognition inspires others to help keep the arts alive through their own artistic endeavors — or through their financial support,” she added. The NACF website offers several examples of the work of artists NACF has supported. “We need the voices of our Native artists and culture-makers. They help make us wiser and more compassionate towards each other, ” said Arquette. 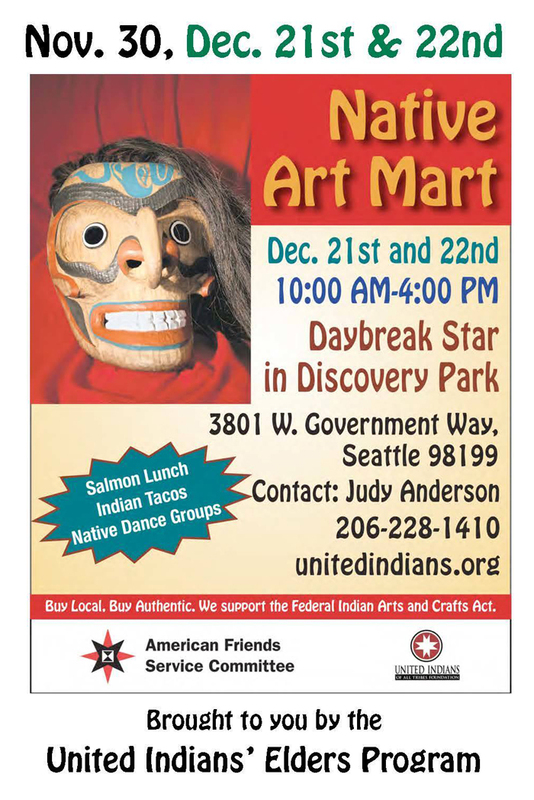 Support your local Native artists next Saturday (November 30th) at the Daybreak Star Art Mart. This fall, SWAIA is launching its first annual NextGen Intensive Performing Arts Workshop for Native youth led by renowned Native artists Brian Frejo, Louie Gong, Ehren Kee Natay and Michelle St. John. NextGen SWAIA Intensive Performing Arts Workshop is a weekend program for Native youth (ages 12–18) that explores art, traditional and contemporary music and dance, and spoken word. A series of interactive workshops will take place from November 15-17. Participating youth will perform in front of an audience on Sunday (Nov 17) afternoon and during SWAIA’s Winter Indian Market (Nov 30). This exclusive opportunity will provide eight Native youth a unique opportunity to work with and learn from renowned Native artists and performers Brian Frejo, Louie Gong, Ehren Kee Natay, and Michelle St. John. Applications are due October 4, 2013. Brian Frejo (Pawnee/Seminole) is a cultural activist, motivational speaker, youth advocate, actor, musician, photographer and DJ. He is a member of the Grammy–nominated drum group Young Bird and plays the Native American flute. Additionally, Frejo has appeared in over twenty feature films and television series in his career. Ehren Kee Natay (Diné/Kewa) is a musician, dancer, actor, painter, and jeweler. Natay has toured the nation as a professional drummer and has been awarded various fellowships for his work as an artist, including the Wheelwright Museum of the American Indian Fellowship and the SWAIA/Heritage Hotels Rising Artists Fellowship. Natay designed t-shirts and merchandise for the 2013 Santa Fe Indian Market Artist Designed Collection. 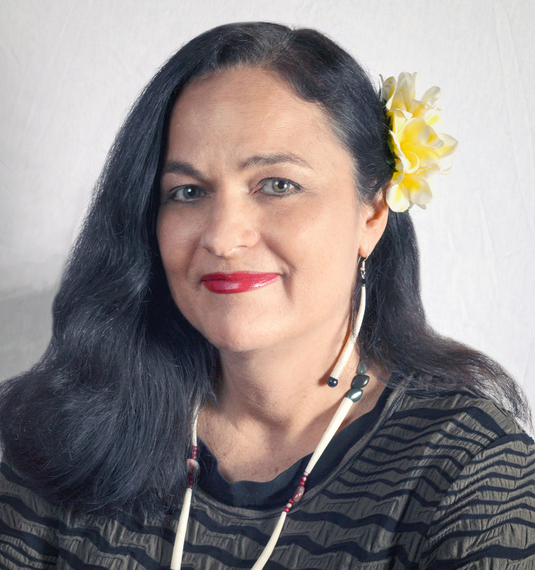 Michelle St. John (Wampanoag) is a two-time Gemini Award winning actor with over 30 years of experience in film, theatre, voice, and music. Her film credits include Smoke Signals, Northern Exposure, and The Business of Fancy Dancing. For ten years she was the co-managing artistic director for the award winning play The Scrubbing Project and co-founded the Native women’s theatre company Turtle Gals Performance Ensemble based in Toronto. St. John is currently a producing partner for Frog Girl Films. NextGen SWAIA Intensive Performing Arts Workshop is open to eight Native students at no cost; all food, lodging, and supplies are provided. Applications are available at this link. Deadline is October 4, 2013.